With the above interpretation, we can see that Chapter 1 is a precise summary of the principle of Tao Philosophy. We are accustomed to think in terms of two opposites. Although we think in terms of opposite objects, we can form dual, true, and equivalent realistic points of view, by superimposing the two opposite objects. Therefore, a dualistic view does not automatically lead us to unrecoverable illusion. We may still reconstruct realities from such a dualistic view. This is the principle of Tao. The basic architecture of Tao described in Chapter 1 may be shown as Fig.1. We can derive the principle and logic of Tao directly from this architecture. In this Figure, the bold-faced terms are the keywords used by Lao-tzu in Chapter 1. Here, Heng Tao represents the absolute reality under our discussion. This reality denotes the true nature of the myriad things. Lao-tzu characterizes this nature as Oneness, as in “Tao begets One, or Tao brings Oneness into being道生一” [Ch.42]. In this architecture, all entities in the phenomenal world are associated with names, while Tao is without such a name. Tao is identified as the Nameless 無名. We use the term actualities and manifestations interchangeably in our formal model discussion. For the myriad things to be realities, we should treat the myriad things as actualities and not as objects. Each object refers to a simplified, truncated, and abstracted concept that can be expressed in our language. The three levels in the architecture are three different and convenient ways to discuss the same Tao. Our description at each level should equivalently represent of the principle of Tao. It is important to note that Lao-tzu does not deny the phenomenal world as pure illusion. The manifestations in the phenomenal world are realistic representations of Tao. To be consistent, our description at the object level should also be able to reflect the principle of Tao. This means that we should be able to use objects to describe the principle of Tao. What we use to describe the principle is not real, but the description of the principle is real. The description will show the same principle of Tao. Our discussion about Tao in the phenomenal world is not superficial. However, we need to identify the proper logic to describe Tao at the object level. This affirms the phrase “Tao may be spoken of” at the object level. In the text, the reference [Ch.x] refers to the verses in Chapter x of the Tao Te Ching. Here [Ch.42] means Chapter 42 of the Tao Te Ching. In terms of quality and quantity, we may also view the actualities as the qualities of the reality and the objects as the quantities associated with the reality. Quality is a whole and quantity is a part. As stated by Lao-tzu in Chapter 1, in order to describe the manifestations, we may rely on the objects (Wu and Yu). The reality is restored when the objects are correlated logically to represent the true manifestations. We shall show how the objects are correlated by their interactions in the systematic model discussed in the next Chapter. The phenomenal world is more complicated. All entities in the phenomenal world are associated with names 名, so they are differentiated with names. In Tao philosophy, there are two kinds of names. At the object level, the objects are dualistic. Each object is assigned a distinct name. Each name represents only a “part” of the whole. As shown in the next Chapter, these objects must be re-integrated to represent the whole. After the re-integration, the objects become complementary in each other. At the actuality level, each Heng Name 恆名 represent the reality, so each of them must be a whole. For our convention, we may call these actualities “dual, but realistic.” They are, in essence, non-dualistic. 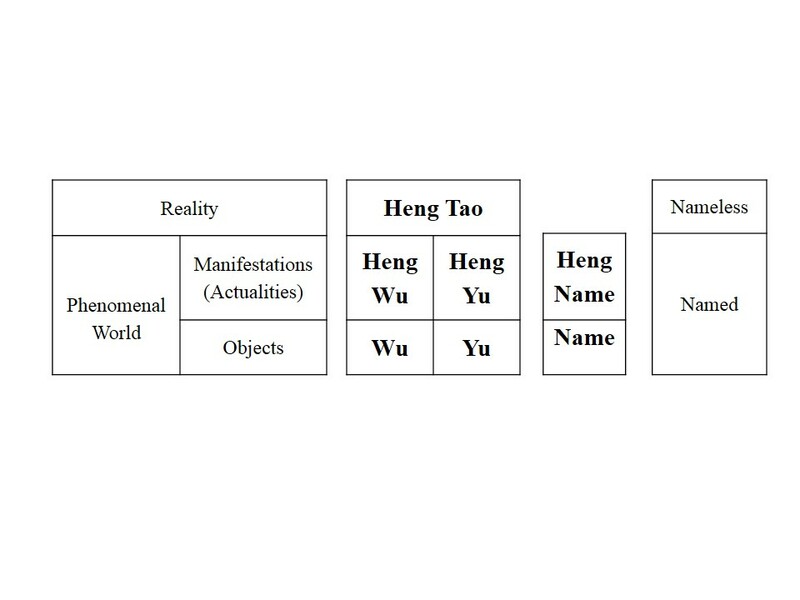 If we consider an actuality as an “enriched” object, then the Heng Names are “enriched” names that can describe realities. Therefore, the manifestations, Heng Wu and Heng Yu, are “dual but equivalent” representations of Tao. The two manifestations are two-and-one at the same time, and are ontologically equivalent to each other. In this structure, the absolute reality and the two manifestations are equivalent and form a trinity. The three act as a monism. We may also discuss our model in terms of the parts and the whole. We may introduce the concepts of “domains” and identify various entities with their domains. The absolute reality has a whole domain, and each object covers a sub-domain. Each manifestation, as a reality, must also cover the whole domain. Objects and manifestations should be clearly distinguished since they belong to different domain. In this logic structure, it is clear that we cannot identify Tao with Wu, since Wu is only a “part” of Tao. An object Wu cannot be treated as the root of Tao since Wu and Yu should not be treated as separate independent realities. Also, Wu and Yu cover separate domains, Yu cannot come from Wu. Something cannot come from nothing. In fact, we may say that Wu and Yu cannot represent anything meaningful in Tao; only the relations between Wu and Yu within Heng Wu and Heng Yu has reality and show the principle of Tao. Lao-tzu clearly discusses a principle in terms of Wu and Yu in the first Chapter. This view will be revisited when we discuss the structure of actualities in our model in Chapter III.